It's Marvelous Middle Grade Monday at Ramblings of a Wannabe Scribe and What Are You Reading? day at Teach Mentor Texts and Unleashing Readers. It's also Nonfiction Monday. I've made no secret of the fact that I loathe, abhor and detest sad books. I've had enough of them, as have my students, and I'm DONE. However, I also make it my aim to read every single middle grade fiction book released every year, since I read all of these books for the Cybils awards. There's no avoiding them. SO! My new rule is this. If there have to be sad books (because language arts teachers seem to love them), they should only be written by authors whose other works include books about evil super villains and Dungeons and Dragons style adventures. That way, there's a good dose of humor to save me from feeling like I am "being beaten about the head with a tear soaked teddy bear." This is almost a reboot of A Begonia for Miss Applebaum, but without the creepy ending and with much better adventures. Yes, I cried buckets. But I laughed, too. THAT, my friends, is good literature! What a wonderful review! I will have to add it to my TBR pile. I totally agree, if a book make you sincerely laugh and cry, it's a good book. I'm curious to read this also. My Kiddo had a favorite Chinese teacher who died of cancer mid-year and it had a very big impact on her students who were never provided counselors to help them cope. Great review. This has been on my future read list for some time. I think a lot of these sad themed stories are the result of editors drooling over them. Kids just want a fun entertaining story. This does sound like a book that would have wide appeal. I'll have to look for a copy. Come see my week here. Happy reading! I've read other's reviews of this too, and am glad you are satisfied with the story, sad though it is. I took over a class long ago for a teacher who had cancer, had to help the young first graders say goodbye. This was not easy, but I remember how sweet those kids were, and how gracious the teacher. Thanks, Karen. 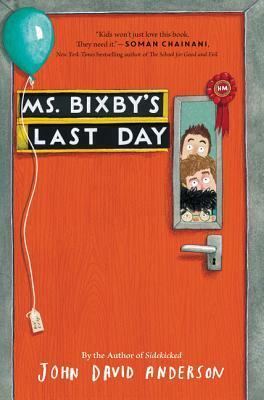 Lovely review, I really enjoyed Ms. Bixby's Last Day too. I hope we will see more of Topher Brand and Steve! Well, I'm glad you finally found a "sad" book you didn't abhor. Sounds as if the humor made all the difference. I'll second Michael G-G's comment - a sad book you like! I am currently struggling through Pax on audio - so very much sadness! Great review! I have this one on my list! Everyone's talking about this book. I really want to read it! I've read other reviews of this book, but after your review, I finally want to read it. Thanks so much! Thanks for this review. I definitely want to get to this book. Wonderful review of what sounds like a wonderful book.